Era Cruise is luxurious brand-new steel cruise which ensures the aesthetic make over and safety for clients. 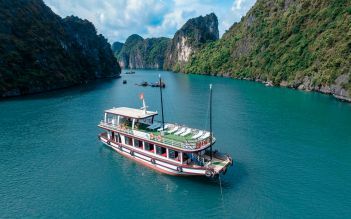 Equipped by the best interior in the world with enthusiastic well-trained crew, Era cruise promises to bring you incredible services and truly memorable experience in Lan Ha bay. 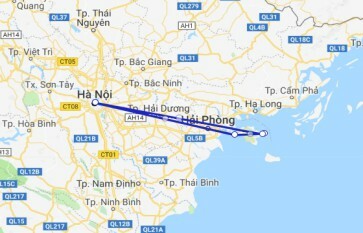 09:00 – 09:30: Optional transfer vehicle will collect you from your hotel in Hanoi and convey you to Got ferry, Hai Phong around 11h30. 20:45 - 24:00: Your free time to relax with an exotic cocktail or whatever takes your fancy. Our bar has a wide range or wines, beers and liquors and is always a welcome sight for guests after a day on Bay. Order a Spa service or take any activities on boat cruise such as watching documentary movies, squid ﬁshing or simply relax on our roof top deck under the cover of a star ﬁlled sky. 07:30 - 09:15: Enjoy the last stage of your trip to Dark & Bright cave and islets by local rowing boats which is a wild and mysterious beauty in the middle of the World Heritage. Back to our main board afterwards. After a lot of research, we chose Era Cruises for our 2nd marriage anniversary vacation and we indeed made the best decision. The cruise was exceptionally good and the staff were really nice. The room was very spacious, had a cosy private balcony and had an amazing washroom with a glass window right next to the bathtub. The food served at the restaurant was also delicious and Chef made a customized menu for us as we couldn't eat certain meat. 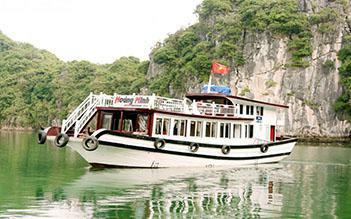 The tour guide, Ms. Phuc (Joy) was also very informative regarding the whole cruise and Halong Bay. Mr. Lucky was also very fast in responding to our needs. The whole cruise was very well managed thanks to them. As it was our anniversary, they gave us a surprise by providing a cake and by decorating our room with flowers. A wonderful gesture indeed. The whole tour was very well planned with ample time for relaxing on your own. The only downside was the room didn't have any Wifi probably because we were in the middle of the bay. Overall, my wife and I had a wonderful cruise thanks to the team. Keep up the good work guys. We will visit again! 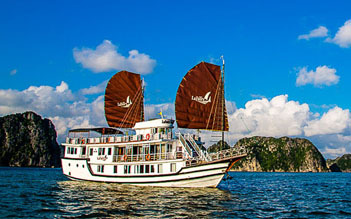 My months of research paid off when I chose to book the era cruise on Haiphong bay. Thanh, Louis, River and David my motor bike guide in the village yesterday were all outstanding. The team go out of their way to ensure you are always looked after and the program runs like clockwork. The suites were clean , roomy and had stunning views of the bay at all times. The excursions were very well planned and organised. 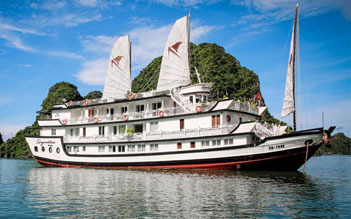 I would recommend the two night over the one night stay to fully experience the cruise. Over night cruise was amazing. Excellent food, the schedule was well planned and explained to us. Organized. Staff works hard to make sure you stay is comfortable. Rooms were jaw dropping luxurious. It was nice to be away from the busy tourist areas. Woke up to watch the sun rise, did tai chi on the deck, had a pedicure. Everything was beautiful. Yes the bay is polluted with trash but it should not deter you for taking this cruise. We kayaked in a clean area of the bay. Food & drinks served were delicious. The staff made the extra effort to make my young boys enjoy themselves. They surprised my boys with French fries & ketchup during lunch. It was not on the menu so my boys were so happy! Wow, what an experience, we wanted to do something special to celebrate a 50th birthday and 21st Wedding anniversary. We travelled with our teenage daughters and wanted something 5star. We got it. From the transfer to the return trip, everything was amazing. They even presented my husband with a birthday cake, dimmed the lights in the restaurant and sang happy birthday. 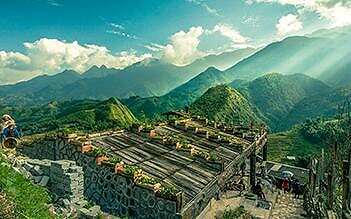 The rooms were amazing and the view unrivalled. We could not have asked for anything more and when we are asked about our trip, we let all our friends know that our Era cruise was the highlight. The only issue was that we wished we had taken the 2 night or longer cruise. We did not want to leave. Thank you Era Cruises.